Intersections: Where do Human Rights Begin? Join the North Dakota Human Rights Coalition at the 2018 Human Rights Summit and Arc of Justice Awards. The theme of the Summit is "Intersections", and discussions will be held around the Missing and Indigienous Women and Girls Crisis, LGBTQIA+ Protections and more. Tickets to the event are $50 General Admission / $20 Students. 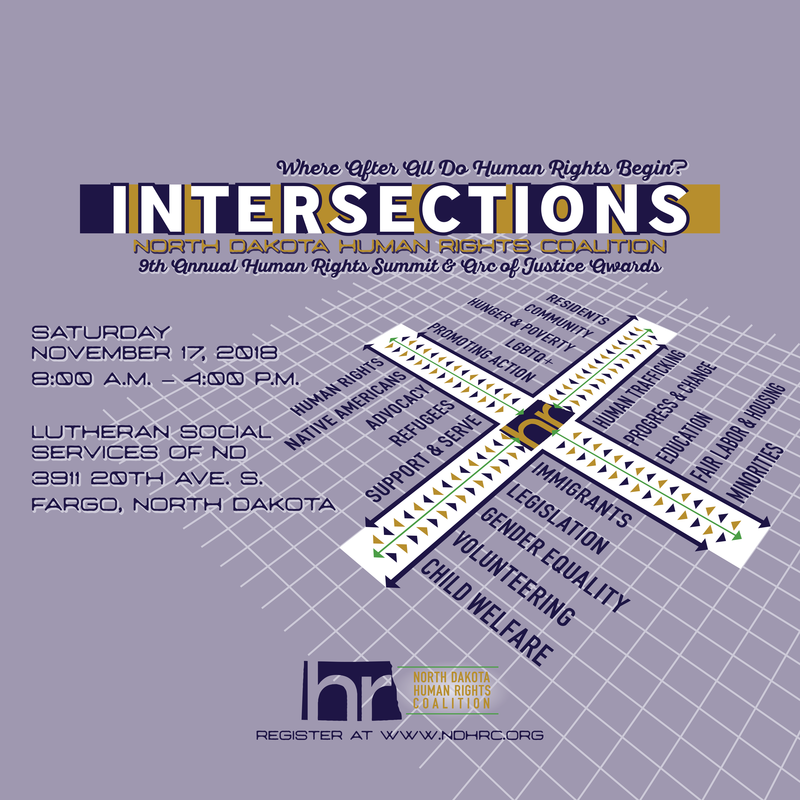 A special combo pack has been arranged with the North Dakota Human Rights Film Festival that includes tickets to all three screenings of the festival in Fargo and a ticket to the Human Rights Summit and Arc of Justice Awards for $65 (a $20 savings). The event will take place from 8 a.m. to 4 p.m. at Lutheran Social Services of North Dakota in Fargo, North Dakota. INTERSECTIONS: "Where After All Do Human Rights Begin?" "How to be progressive in a Red state"
LGBTQA anti-discrimination bill – what's the plan?